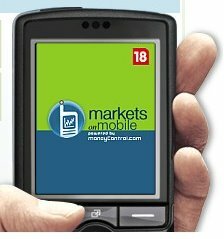 Markets on Mobile is a free J2ME mobile application to stick to stock markets, And Iam the die hard user of this software in my mobile( Sony Ericsson – K550i) for the past 7 months. Tracking my own favorite stocks live while travelling. I bet you this software really suits for Investors,Traders who dumped their money in stock markets. Assume that you dumpled nearly a lakh in stock markets. And you are in a holdiday trip, or in a meeting, or in front of your boss nearly disconnected from markets. So here comes the play to track your stocks at a cheapest mode. A GPRS enabled handse is enough to download this software to stay connected with markets. 4)And the rest comes Market News and outlook, Live Nifty and Sensex scores, World Indicies, Portfolio Tracker Top lossers,gainers, Stocks trading above 52 week high and lows all on your mobile screen on the go. Send MOM to 52622 to receive a link to download Markets on Mobile. Go to http://m.moneycontrol.com on your WAP browser. Please check handset compatibility list before downloading. Receive link in your mobile.